ORANGE, Calif., March 19, 2019 / -- The Amtrak Pacific Surfliner® is offering special savings on midweek train travel through May 23, 2019. For a limited time, passengers who travel midweek, from Monday through Thursday, can purchase one full-fare adult ticket and book an additional ticket on the same reservation at a 50 percent discount. "We are excited to offer this promotion as part of our Hug the Coast campaign, which celebrates everything that makes Southern California great," said Al Murray, chairman of the Los Angeles – San Diego – San Luis Obispo Rail Corridor Agency, which oversees the Pacific Surfliner service. "We hope this encourages midweek getaways and scenic train trips along the coast to our region's beautiful beaches, natural preserves, and vibrant downtowns." To take advantage of the Midweek Getaway Discount, purchase one full-fare adult ticket for Pacific Surfliner travel, and receive one additional ticket at a 50 percent discount on the same reservation. Book through PacificSurfliner.com, Amtrak.com, or the Amtrak app, select "Adult" as passenger type (for all passengers), then enter V402 in the promotion code field. Tickets can also be purchased by calling 800-USA-RAIL or visiting a staffed station and referring to discount code V402. 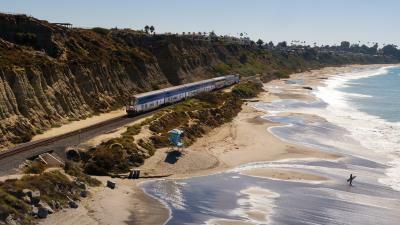 The Pacific Surfliner carries nearly 3 million passengers a year and offers daily service between San Diego, Orange, Los Angeles, Ventura, Santa Barbara, and San Luis Obispo counties, connecting travelers to popular destinations along the Southern California coast. Visit pacificsurfliner.com/save to view complete details on the Midweek Getaway Discount.